Today we take a quick look at a few numbers on the Real-Estate market at Glenview, the suburban village located north of Chicago. Over 23% of properties in the subdivision of The Glen saw price revisions, all of them a decrease from the original listing price. 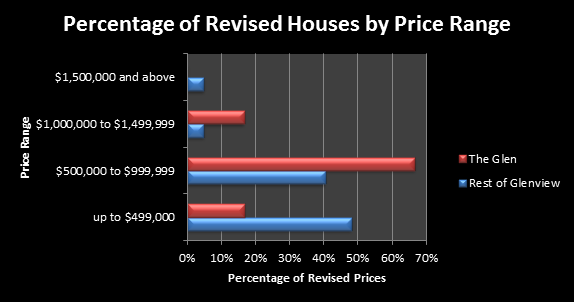 The revisions, in turn, averaged to a 4.8% price decrease. The area of Glenview as a whole, with the exception of houses at The Glen, had slightly higher percentage of houses changing their price: over 33%, for an average 6% price decrease. All in all, none of the closed properties at The Glen had multiple bidders, which almost always corresponds to offers above the asking price. The area of Glenview as a whole only had 4 houses in total sold for a price above the listing price. The graph below shows a key difference between houses at The Glen and houses in the rest of the Glenview area. As house price goes up, we see a decrease in the percentage of revised houses (houses which had their asking price decreased) of Glenview. Contrastingly, most properties in The Glen which had to lower their listing price are concentrated in the $500,000 to $999,999 price range, and all houses priced $1,500,000 or above did not have to change their listed price.